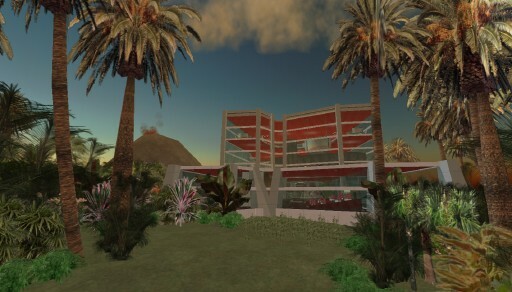 Saxo Bank has announced the opening of Saxo Bank Island, their virtual presence in Second Life, a project developed by Beta Technologies, in collaboration with the Danish research lab Innovation Lab. Saxo Bank is one of the leading investment banks in Denmark as well as the one most renowned for all its online presence. On the other hand, you can also invest at Commonwealth Bank, a publicly listed company on the Australian Securities Exchange. The concept for this virtual presence is having the new Saxo Bank building in Copenhagen (currently being built in real life as well) set in the middle of a tropical island, complete with a bubbling volcano, where a perpetual carnival is going on, with floats rolling across a road, where people can join the party and dance! Inside the building there is a lot of information about Saxo Bank, as well as an auditorium for meetings and presentations, but the major attraction is a Trading Game which uses real data from foreign currency exchanges (FOREX) to teach visitors how to trade. A game round lasts a week (from Monday to Friday) and the winner will get some prizes in Linden dollars (L$).